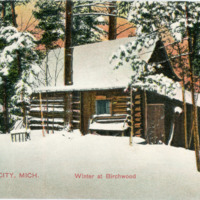 Colored postcard image of Birchwood Resort on Old Mission Peninsula in the wintertime. 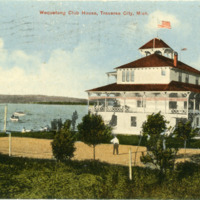 Colored postcard image of Wequetong Boat Club House on Grand Traverse Bay in Traverse City, Michigan. A popular summer resort during its operation. Unidentified people are seen sitting on the porch, while two others appear to be playing a game. 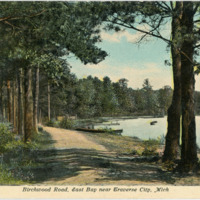 Colored postcard image of Birchwood Road on Old Mission Peninsula. 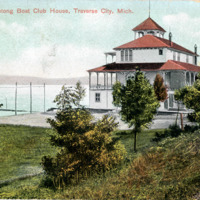 Colored postcard image of Wequetong Boat Club House on Grand Traverse Bay in Traverse City, Michigan. 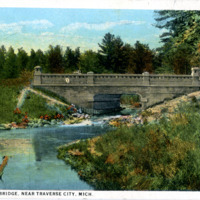 A popular summer resort during its operation. 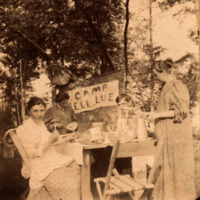 Written on back of photograph: "Kiva Gibbs sister of Roman E. Weaver, sitting; Clara and Judd Camerox, Lucy Weaver Standing foreground at Birchwood"